Earlier, I had posted about my experimental digiscoping with a Minolta Dimage x20. On field testing, I had more blurred pictures than good ones and I wished I had invested in a camera with a bit more manual controls. 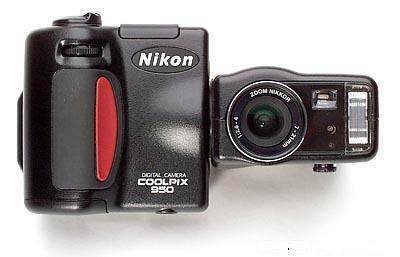 Thus inspite of my almost empty purse, I always had my eye on ebay for a good coolpix series camera that fell within affordable range. I thus ended up bidding and being outbid on a Nikon Coolpix 950 - a camera which is said to be amongst the best for digiscoping. However, it seems like luck and fate was on my side that day as, the highest bidder defaulted and I was offered a second chance on the item. A bit of haggling over emails with the seller brought me a good deal as the wonderful seller offered the camera to me for a mere £23.00 and next day delivery. I now thank my stars for having accepted. A few other CP950s that I`ve been keeping track of on ebay have been selling over £35.00! Yesterday one of the same sold for £80.00 ! I recieved my cp950 as promised and as soon as I held it up to my scope I was amazed at how suited it was for digiscoping. First of all, as soon as it is switched on, the camera zooms in almost fully eliminating that vignetting without you even having to adjust. The twistable body allows you to see the screen whether your camera is too high or two low. 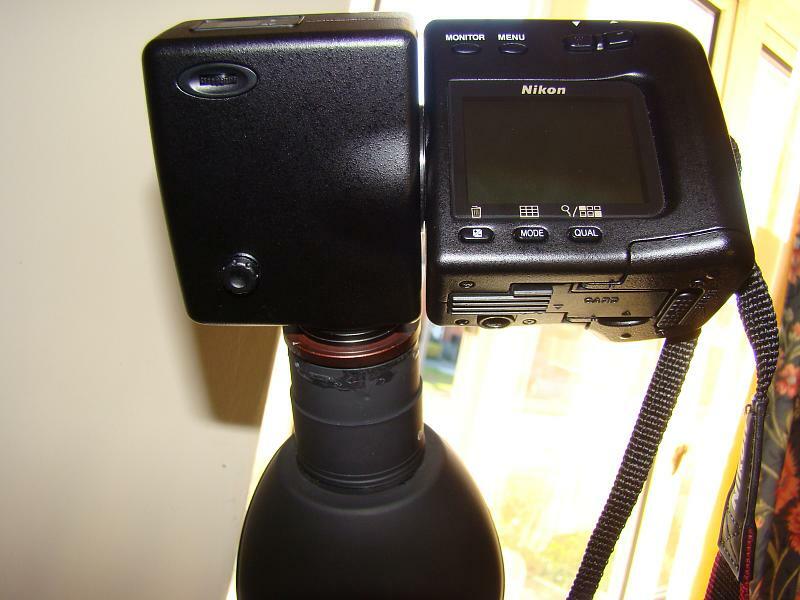 It also allows one to direct the LCD away from direct sunlight. I`m really happy with my purchase, if any of you are on the lookout, there maybe some still available on ebay - check this link. I now had a decent digiscoping camera and a not so bad Scope. I now had to marry one up to the other. There were two problems with this. 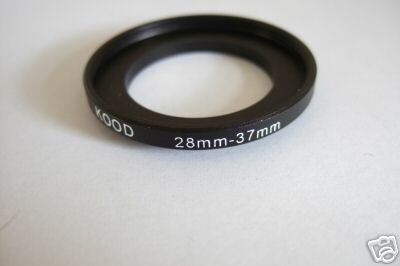 The camera objective is 28mm and the scope eyepiece is 37mm. I could easily overcome this problem with a 28-37mm adapter, which I did buy on ebay. 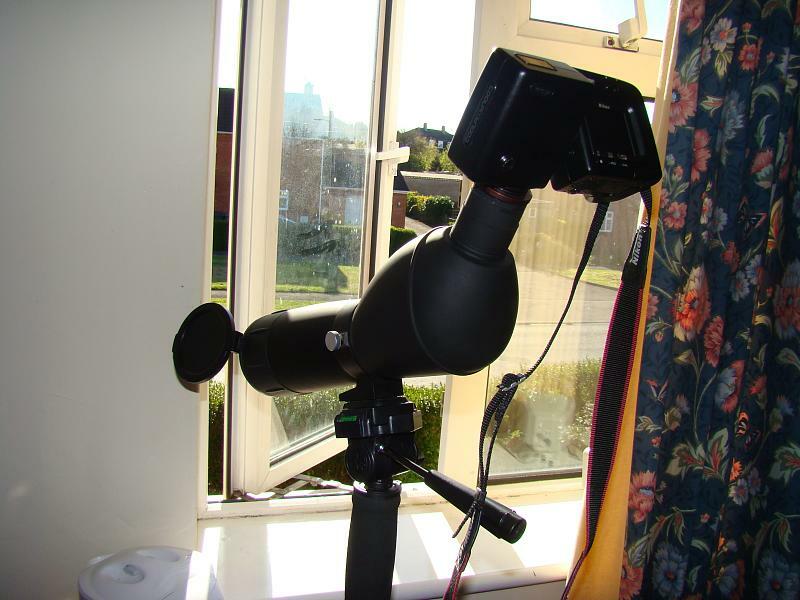 However, the other problem was that while there was a screw on thread for the camera, the scope eyepiece had no thread. I was going to have to find a way to join it without screwing it. I pondered and pondered and tried all my DIY skills to come up with an idea but everything that I tried was unsatisfactory and resulted in camera movement or unstable sitiuations. Finally after a whole day I realized the only solution was the simplest one - to fix the adapter onto the scope and then screw the camera on. I managed to come up with a surefire method to accomplish this. 1) First of all I removed the rubber cap covering the scope eyepiece to expose the plastic below that mounted the lens. 2) I heated up the stove and placed the adapter, wide side below onto the stove. 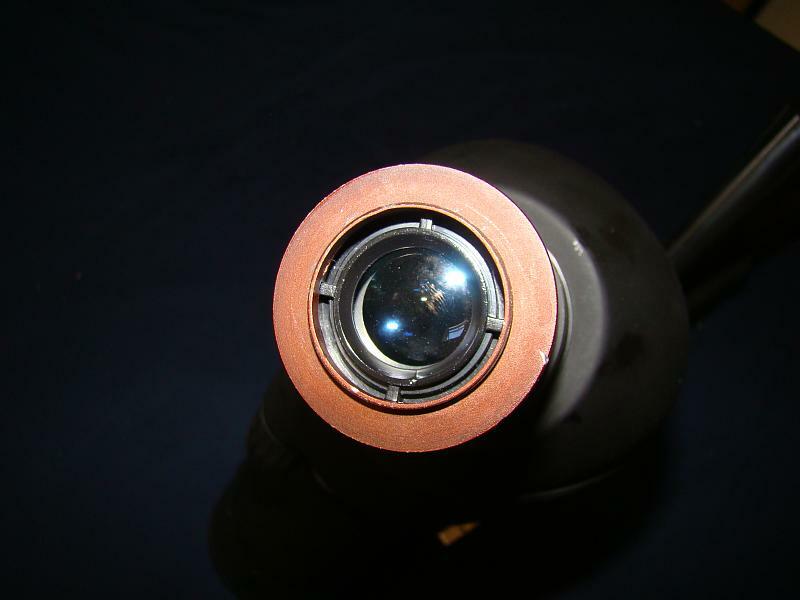 3) When the adapter was really hot, I picked it up using a pair of pliers and placed it level onto the eyepiece, and gently pressed it down so that it melted the plastic and settled firmly into place. 4) I now dabbed a wet cloth onto the hot adapter to cool it and prevent it from melting the plastic further or transferring the heat onto the lens. ...and viola it sat fixed in place as if it had been built in! However, I had made one grave mistake. When I screwed in the camera, It screwed in and sat at an angle and not in line with the scope. I could rectify the positioning by adjusting the zoom ring on the eyepiece but I found that due to the weight of the camera, the eyepiece would move by itself and 20x was the only position it would stay locked (but skewed). 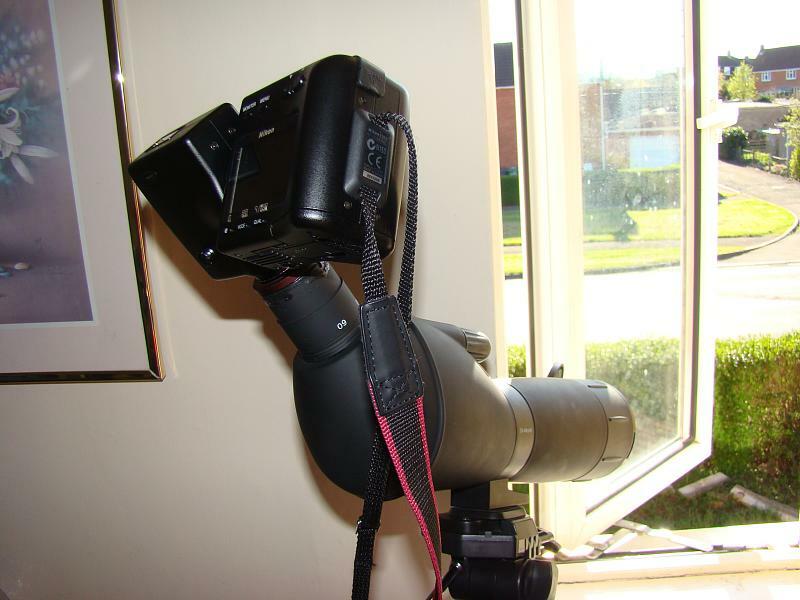 Also, I feel 20x is the ideal zoom for digiscoping so I needed the camera to be level in this position.I therefore had to reheat the adapter while it was on the scope (and risk damaging the lens) and adjust the adapter into the correct position. It worked without any damage and I now had an inbuilt adapter. The only side effect I noted was that due to the heat, the colour of the paint on the adapter turned from black into a dusty red. I screwed in my camera onto the adapter and viola.. it was perfect! Why had`nt I thought of this earlier! I'm going to be field testing the setup soon enough and I hope it wont let me down, so keep watching. I`m sure there are many who are going to want to try a similar method. Before you try the same, please bear in mind that mine is a cheap spotting scope (bought from ASDA for £25)and I had little to lose in case I messed up. I`m lucky it worked ! I accept no responsibility for any damage resulting from an imitation of my method!